Gertrude Pridgett Rainey, better known as Ma Rainey (April 26, 1886 – December 22, 1939), was one of the earliest known professional blues singers and one of the first generation of such singers to record their music. She was known as the "Mother of the Blues." 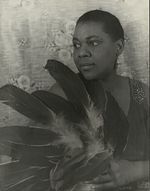 Rainey did much to develop and popularize the blues genre and was an important influence on younger blues women, such as Bessie Smith, with whom she had worked. Her recordings also influenced the emerging generation of blues singers, men and women alike. Although she did not grow up with the blues, Rainy mastered the style early in her career as a teenager. After a successful touring career in southern venues, at the age of 38 she signed with Paramount Records in 1923. She went one to record at least 100 songs, several of them classics such as "See See Rider," "Bo-Weavil Blues," and "Ma Rainey's Black Bottom." Her backing bands included jazz greats such as Louis Armstrong and arrangers like the gospel legend Thomas A. Dorsey. Rainey enjoyed great success both as a recording artist and a touring performer throughout the 1920s. She retired around 1933 to Columbus, Georgia, where she died in 1939. 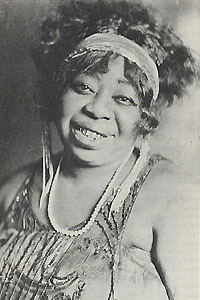 Born in Georgia or possibly Alabama as Gertrude Pridgett, Ma Rainey grew up in Columbus, Georgia. She may have later changed her birthday to make herself appear three and a half years younger than she actually was. The 1900 census states her birth date as being September, 1882. However, her biographies usually say April, 1886. She first appeared on stage in Columbus at the Springer Opera House in 1900, performing as a singer and dancer in "A Bunch of Blackberries," a local talent show, probably at the age of 14. She then joined various traveling vaudeville troupes. After hearing a blues song sung by a local girl in 1902 at a theater in St. Louis, Missouri, Rainey started performing in a blues style. She claimed that she was the one who coined the name "blues" for the style. However, other musicians and singers who performed in the style deny this, affirming that the genre had always been known as the blues. Nevertheless, blues historians confirm that she was the first woman known to incorporate blues into vaudeville, minstrel, and tent shows. Gertrude Pridgett married fellow vaudeville singer William "Pa" Rainey in 1904, billing herself from that point as "Ma" Rainey. Reportedly while performing with a troupe led by Moses Stokes in 1912, the Raineys met the young Bessie Smith, who was eight years younger than Ma. The degree to which Rainey was responsible for training Smith as a blues singer is a matter of debate, but Rainey clearly was an important influence on her. Smith had originally been recruited for the group as a dancer. In 1915, the Raineys were traveling with Fat Chappelle's Rabbitt Foot Minstrels. Later, they billed themselves as the "Assassinators of the Blues" and toured with Tolliver's Circus and Musical Extravaganza. Ma Rainey separated from her husband in 1916 and soon began performing with her own band. She was billed as "Madam Gertrude Ma Rainey and Her Georgia Smart Sets." Besides her own act, these performances included a chorus line and a carnival show. Rainey traveled extensively as a performer and her singing style shows more than passing familiarity with authentic country blues. Author Daphane Harrison, in Black Pearls: Blues Queens, says of Rainey: "Her ability to capture the mood and essence of black rural southern life of the 1920s, quickly endeared her to throngs of followers throughout the South." Rainey was already a popular veteran performer with decades of touring experience when she made her first recordings in 1923, at the age of 38. Meanwhile, Mamie Smith had recorded the first known blues side three years previously. Rainey signed with Paramount Records and, between 1923 and 1928, she recorded 100 songs. 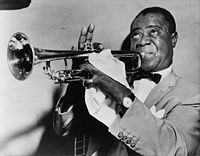 Louis Armstrong can be heard on many of Ma Rainey's recordings. Rainey's first recording session featured the traditional "Bo-Weevil Blues." "Moonshine Blues," and "Yonder Comes the Blues" soon followed, the latter featuring Louis Armstrong on horn. She also recorded the blues standard "See See Rider." Rainey thus came to hold the copyright to a song which would eventually be covered by more than 100 other artists. Her version is universally recognized as one of the best. Rainey was often accompanied by such jazz notables as Armstrong, Kid Ory, Fletcher Henderson, and others, billed as her "Georgia Jazz Band." Most of her recordings thus display a Dixieland flavor, with New Orleans-style trumpets and clarinets providing a sometimes incongruous counterpoint to her more countrified blues singing. On these recordings, Rainey shows herself to have a huge voice, but also a sensitive quality that brings home the poignant passion of the blues. However, many find her at her best on those few records where she is accompanied by a simple jug band ("Deep Moaning Blues") or by slide guitarist Hudson "Tampa Red" Whittaker ("Sleep Talking Blues"). 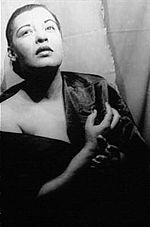 Many of her recordings dealt frankly with love and sexuality. Her songs told stories of betrayal, leaving one's lover, hard work, and other themes typical of the black experience in the rural south. At times they expressed an uninhibited, infectious joy in sensuous dance tunes. She even recorded one song ("Prove It on Me") dealing with lesbian themes. Rainey was known as a reliable professional on stage, as well as a shrewd businesswoman. After her initial success, she joined a promotional tour arranged by Paramount. Thomas A. Dorsey, later famous as a gospel songwriter, served as her arranger, manager, and pianist. He also recruited members for her new Wild Cats Jazz Band. Rainey's debut appearance at the Grand Theater on Chicago's State Street was the first time a country-style blues artist appeared at this well known venue. For these performances, Rainey appeared in long gowns and ostentatious jewelry. Rainey not only had a powerfully expressive voice but projected a huge, charismatic stage presence that often brought her audience to a frenzy of cheering. Said Dorsey: "She possessed listeners; they swayed, they rocked, they moaned and groaned, as they felt the blues with her." Rainey was extremely popular among southern blacks in the 1920s, but the Great Depression and the fading commercial popularity of the blues ended her recording career by 1933. Rainey still performed, although the Depression and the rise of radio had badly hurt the vaudeville circuits on which she had been so popular. She thus often played tent shows and fairs. After her mother and sister died, Rainey retired completely from the music business in 1935, returning to her hometown of Columbus, Georgia. There, she reportedly owned two theaters, the Lyric and the Airdome. She was also devoted to a local Baptist church. Ma Rainey died of a heart attack in 1939. As one of the first female blues singers to become a popular recording artist, Ma Rainey's legacy is a large one. She influenced countless blues singers that came after her, male and female alike. Nor is her influence a mere function of her good fortune in getting in on the ground floor of the blues recording business. Her records demonstrate her greatness. In addition to her well known impact on Bessie Smith, Rainey was highly influential on later performers such as Billie Holiday, Charley Patton, Son House, Blind Lemon Jefferson, Robert Johnson, Howlin' Wolf, Blind Blake and Willie Dixon. A number of the songs she recorded have become blues standards, such as "See See Rider Blues," "Walking Blues," "Gone Daddy Blues," and the popular dance tune, "Ma Rainey's Black Bottom." Ironically, her expressiveness as a straightforward country-style blues woman sometimes clashed with the creativity of the jazz musicians who usually backed her in the studio. However, there can be no doubt either about Rainey's importance or her greatness as an authentic blues singer. The 1982 August Wilson play Ma Rainey's Black Bottom was based on her career and took its title from her song of the same name. Rainey can also be seen as a social pioneer, and even a revolutionary. In her singing, she has been lauded as outspoken on women's issues and a role model for future women entertainers who took control of their own careers. Marxist intellectual Angela Y. Davis, in her 1998 book Blues Legacies and Black Feminism: Gertrude "Ma" Rainey, Bessie Smith, and Billie Holiday, portrays Rainey as a model of how African-American women from poor and working-class backgrounds could overcome the barriers of a racist, capitalist society without compromising their values. Davis also sees Rainey as an example of female sexual power which embraces both heterosexuality and lesbianism. She cites Rainey's song "Prove It on Me," which describes a cross-dressing female who unashamedly dates other women. In 1990, Ma Rainey was inducted into the Rock and Roll Hall of Fame. She had been inducted into the Blues Foundation's Hall of Fame in 1983. ↑ Ma Rainey www.biography.com. Retrieved May 31, 2008. ↑ Some reports put Rainey with the Rabbit Foot Minstrels when she first met Smith. This page was last modified on 28 June 2008, at 01:52.